Captain Kyle L. Kirkpatrick was born in Longview, Washington. He graduated with a Bachelor of Science Degree in University Studies from Brigham Young University-Idaho. In 2000, Kyle enlisted in the Idaho National Guard as a Cannoneer (13B) and went to Basic Training and Advanced Individual Training at Fort Sill, OK. CPT Kirkpatrick was among the first of three to commission as Second Lieutenants from BYU-I in the United States Army where he was selected to the Air Defense Artillery Branch. 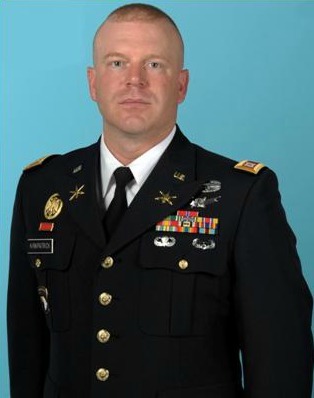 CPT Kirkpatrick was assigned to the 2nd Battalion, 44th Air Defense Artillery at Fort Campbell, KY. He also served as the very first Executive Officer for HHC, 1st Space Brigade at Peterson AFB, Colorado Spring, CO. He later went on to serve as the Vice Chief of Brigade Plans with 1st Space Brigade. After attending the Air and Missile Defense Captains Career Course he was assigned to the 6th Air Defense Artillery Brigade as the Brigade Adjutant during 6th ADA Brigade’s BRAC move from Fort Bliss, TX to Fort Sill, OK. After 21 months commanding B Battery, 2nd Battalion, 6th Air Defense Artillery at Fort Sill, OK he was selected to command A Battery, 3rd Air Defense Regiment (JLENS) at Dugway Proving Ground, UT. His personal decorations include the Bronze Star Medal, Army Commendation Medal (1OLC), Army Achievement Medal (3OLC), Army Reserve Component Achievement Medal, Military Outstanding Volunteer Service Medal, and the Meritorious Unit Citation. He also wears the Air Assault Badge, Parachutist’s Badge, Air Force Space Badge, and the Combat Action Badge.